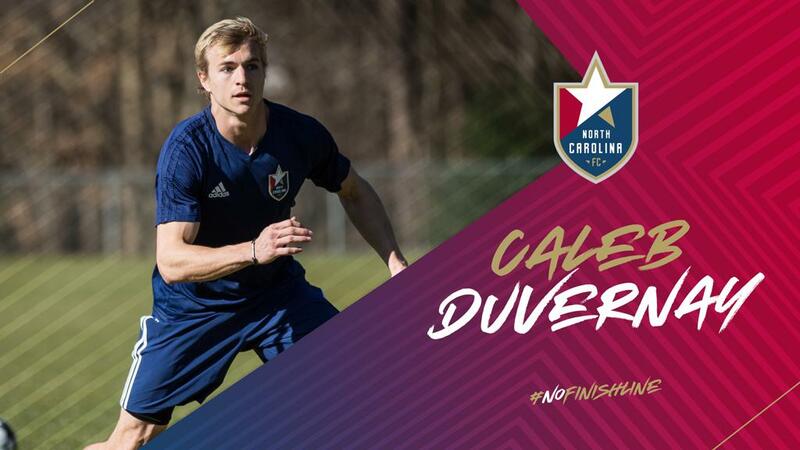 CARY, N.C. (March 15, 2019) – Caleb Duvernay has signed a professional contract with North Carolina FC, pending league and federation approval. Duvernay had a successful preseason trial with the club prior to signing a contract. The Cary, N.C., native is a homegrown player in the truest sense. Duvernay is the first player in club history to play for NCFC Youth Academy, play for NCFC U-23 and sign a professional contract with the first team. "We're pleased to add Caleb to our roster as he represents another local athlete to join our club,” said North Carolina FC Head Coach Dave Sarachan. “Having him in with us during pre-season, Caleb has earned his way onto our roster through his hard work and quality. With the addition of Caleb to our roster, he offers us depth and balance to our backline." Duvernay has been a part of NCFC Youth since he started playing soccer as a child. His prowess led him to NCFC Youth Academy and he enjoyed a successful youth career. Duvernay earned 2013 Development Academy 15/16 Starting XI honors and participated with the U-15 and U-17 U.S. Youth National Team Residency Program. Following his youth career, Duvernay joined NC State where he made 67 appearances, played 3,123 minutes, scored two goals and recorded seven assists as a four-year starter. During the summers, Duvernay was a standout performer with NCFC U-23 for four-straight seasons from 2015-2018. At the end of his collegiate career, the defender was drafted by the Portland Timbers with the 61st pick in the 2018 MLS Superdraft. Duvernay trained in Portland during the MLS preseason before he rejoined NCFC U-23. To see the full list of NCFC’s 2019 roster, click here.